My pie-in-the-sky goal for the clock speed of this computer was originally 10 MHz. The LS series chips should be capable of 16 MHz, but that's not accounting for the poorly engineered environment of a hobbyist's breadboard computer. I figured 10 MHz would offer enough head room for the chips to cope. As it turns out, the limiting factor is the EEPROM, which takes 150ns for the data to be valid after changing the address. If I set the address on the rising edge of the clock and read the data on the falling edge, that would be a period of 300ns or a frequency of 3⅓ MHz. While that's only one third of my original goal, it's well within the range of early personal computers (not that the performance will be remotely comparable). So now I actually have a realistic target frequency, which likely can be pushed a dozen or two percentage points beyond spec (hello, overclocking!). Unfortunately the trusty 555 just isn't up to the task. First of all, most sources I've read say it's only good up to about 1 MHz. But as an easily adjustable variable frequency (i.e. a single dial), the range and resolution are extremely limited. I'm using a 1 M potentiometer right now. In order to have a usable range between, say, 0.5 Hz and 32 KHz, I have to manually switch from a 10 μF capacitor to a 10 nF. I'd need to go down another two orders of magnitude on the capacitor or up two on the resistor to reach 3⅓ MHz, and as I mentioned earlier, that would push the 555 well beyond its limits. The adjustment resolution is similarly frustrating. Even though the potentiometer changes resistance linearly, the effect on clock rate highly non-linear. At the low speed end of the dial, a tiny movement makes a large difference in the clock speed. At the high speed end, the duty cycle changes more than the frequency. Speaking of the duty cycle, in order to keep the time spent on as close as possible to the time spent off, the capacitors and resistors need to be in particular ratios. To get a variable 555 timer with an even duty cycle, you would need both a potentiometer and a variable capacitor, each with an abnormally wide range. As I mentioned in a previous post, the uneven duty cycle means the chips had to respond as if the clock was around 600-700 KHz even though the clock period was only 32 KHz. 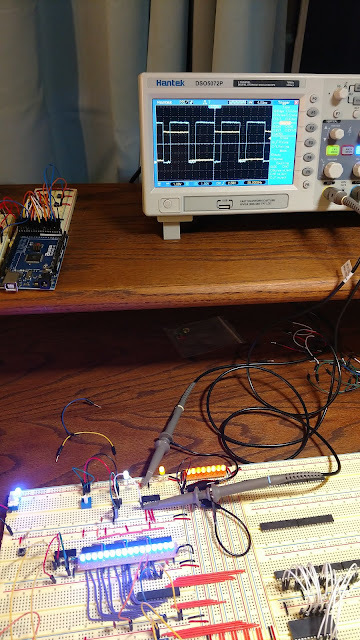 If I had a 3⅓ MHz clock with an 88% duty cycle, the chips would be seeing a pulse 18ns wide, which is equivalent to ~28 MHz with a 50% duty cycle. As a quick fix for the duty cycle issue, I switched the inverter on the clock for a 74LS73, using one of the J/K flip-flops in toggle mode as a single-bit counter. Since it changes with each pulse rather than at each clock edge, its output will have a duty cycle as even as the 555's period. 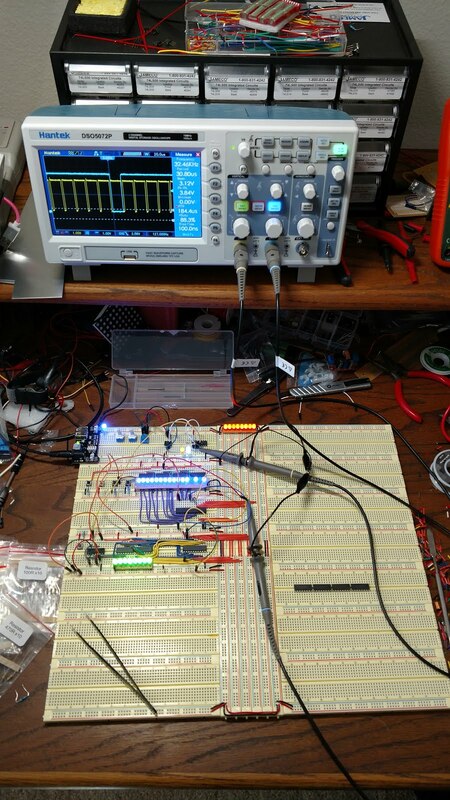 However, the period of the flip-flop's output will be half that of the 555, so I replaced the 10 nF capacitor with a 4.7 nF to maintain the frequency range I was used to. 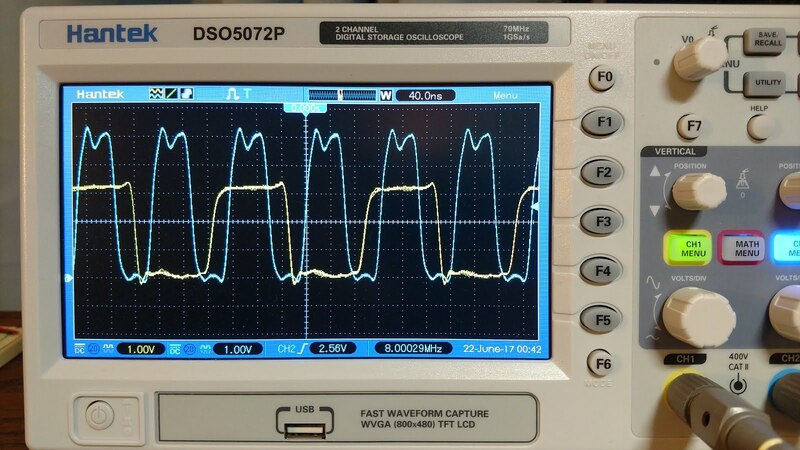 The blue line on the oscilloscope is the output of the 555 timer. You can see how it spends significantly more time on (up) than off (down). The yellow line is the output of the flip-flop. You can see how it rises or falls every time the clock signal falls. 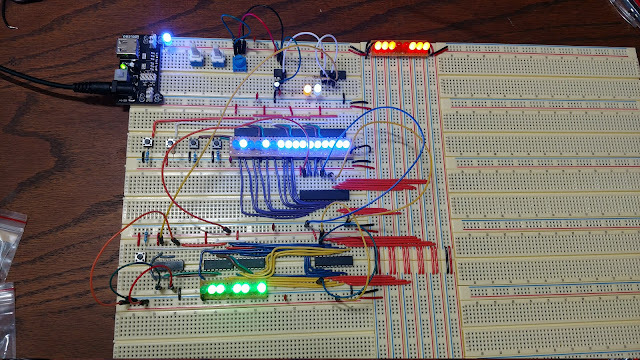 Since I'm using a "raw" flip-flop instead of a counter chip, I have access to both the Q and Q' outputs to use as clock and inverted clock. 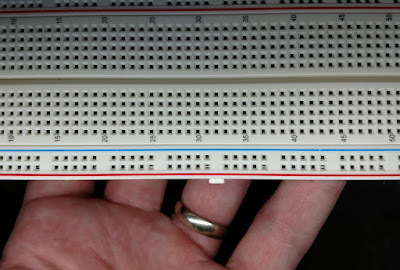 The white and yellow LEDs are connected to them, respectively. One of my first toy projects when I got back into electronics was a slowly shifting RGB mood light on Arduino. 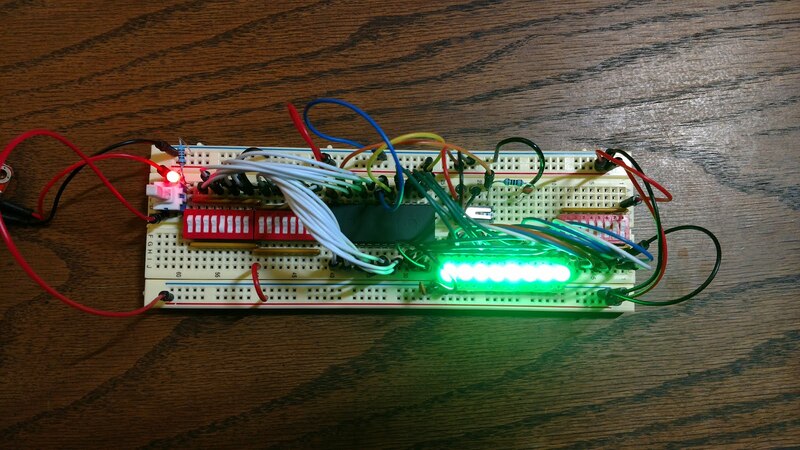 The LED itself is on a tiny breadboard and attached to the arduino with 3 signals and ground. 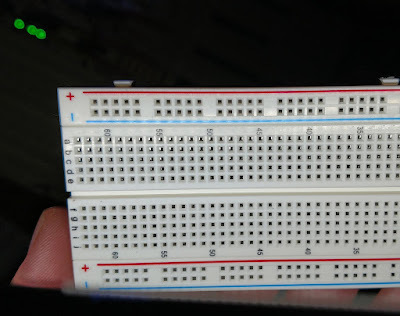 I wanted to put the code on an ATTiny on the same board as the LED for a truly minimalist design. The ATTiny requires an external crystal to run at full speed, so I got a crystal assortment from 4 MHz to 25 MHz. I haven't made much progress on that project, but I do have everything I need for a stable, high frequency clock for the BFCPU. The metal can on the left is an 8.000 MHz crystal. When it's resonating, it generates a near sine wave at that frequency, but it doesn't provide much current. The nearest chip is a 74HC04 hex inverter. As a CMOS chip, its inputs respond to voltage rather than current, but its outputs can provide a wide range of current. This allows it to act as a gateway between the crystal and the TTL chips. Since the output of the first inverter is part of the crystal feedback circuit, it runs through another inverter to actually provide the 8 MHz clock signal for the rest of the system. The other chips on the board are all 74LS93s, the ripple-carry cousins of the '193 counters that make up most of the computer so far. These act as frequency dividers, giving me a selectable clock speed for any power of ½ of 8.000 MHz (4 MHz, 2 MHz, 1 MHz, 500 KHz, etc. ), down to 0.4768 Hz, or about one cycle every two seconds. I'm only interested in a single "bit" at a time, so the ripple carry isn't going to be an issue. The two 22 pF capacitors on the left corner of the board are part of the crystal resonator. The bypass capacitors straddling the high frequency chips from near to far are 1 nF, 4.7 nF, 10 nF, and 47nF, chosen experimentally to minimize noise on the outputs. There are also a couple of 100 nF capacitors across the power rails closer to the low frequency chips for the same purpose. With nothing attached to the clock I was getting some pretty significant ringing in the outputs, sometimes as much as +6 V to -1.5 V peak-to-peak. 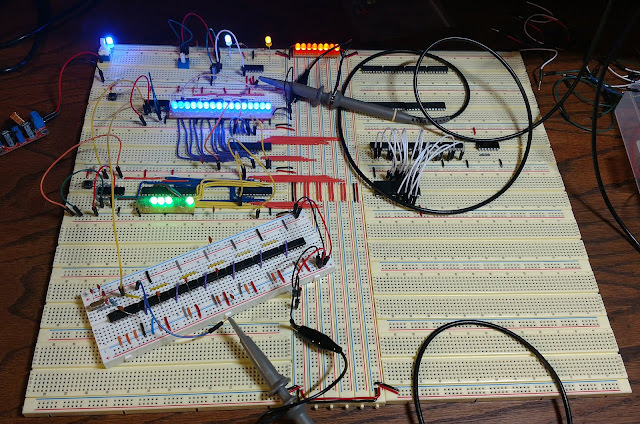 It turned out to mostly be inductance from the oscilloscope probes, and pretty much disappeared when the clock was attached to other parts of the circuit. In this shot, the long yellow lead on the left is connected to the 8 MHz output of the CMOS chip, and into the count enable circuitry of the Data Pointer and Data Register. The blue lead/oscilloscope probe is connected to the same signal. The scope is triggering on the clock signal, and you can see the measurement of 8.00029 MHz in the lower right. As expected, the first counter stage is flipping with every pulse. 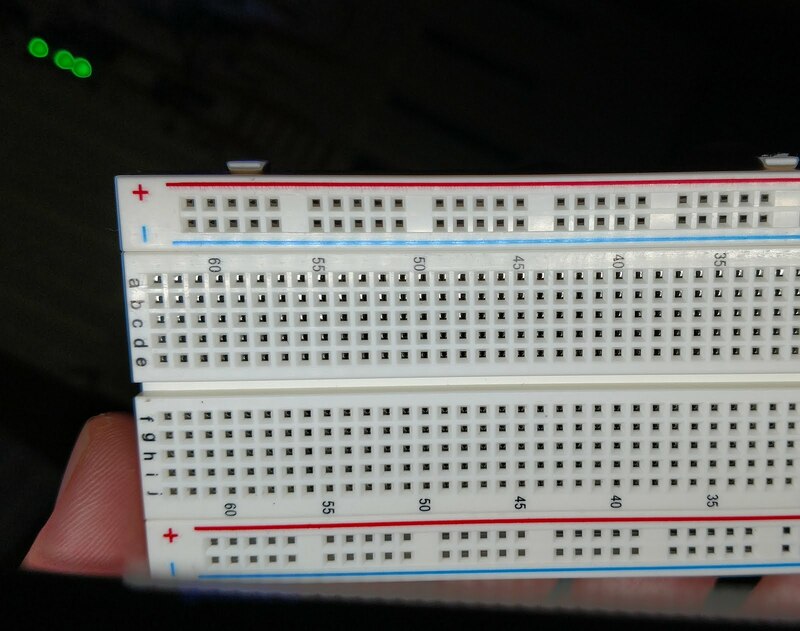 The edges don't quite line up because of the propagation delay in the counters and the NAND gates combining the clock with the control lines. If I had measured the clock at the counter input, the edges would be much closer. I left this running for an hour or so with "infinite persistence" and there wasn't a single glitch. So far so good for pushing the limits of my components! This isn't just an artifact of the camera or variability in LED quality or resistor value (which is also noticeable). If the switching speed were instantaneous, the LED would be spending just as much time on as it is off, so the only reason the brightness would be different is if the amount of current flowing is different. 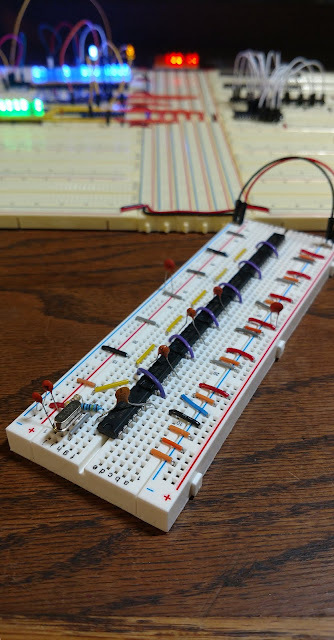 Since the resistance of the LED (plus resistor) is essentially fixed, the only way the current can be different is if the voltage is different. Switching speed is not instantaneous, and doesn't change very much with clock speed. At high frequencies, instead of 50% on 50% off, it's more like 40% on, 40% off, 20% somewhere in the middle. This amplifies the effect of the already lower voltage. The Data Pointer's up/down signals are now connected to the clock and control lines via NAND gates, just like the Data Register. The only buttons left are Clear signals. The Data Pointer doesn't ever load data, the load lines are all tied high. In a couple of the pictures above you can see the beginnings of the program side. From top to bottom is the Stack Pointer, Stack RAM, Program Pointer, and Program ROM. 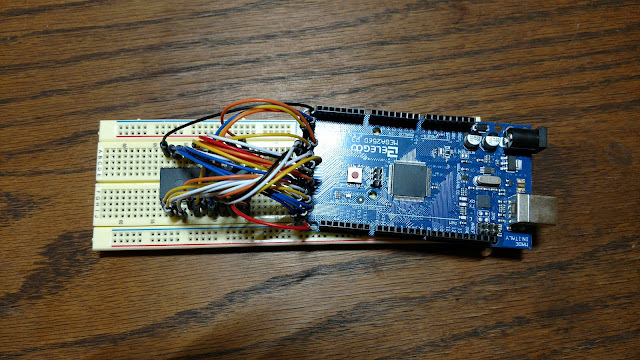 I'm in the process of wiring up the Program Pointer to the Program ROM. 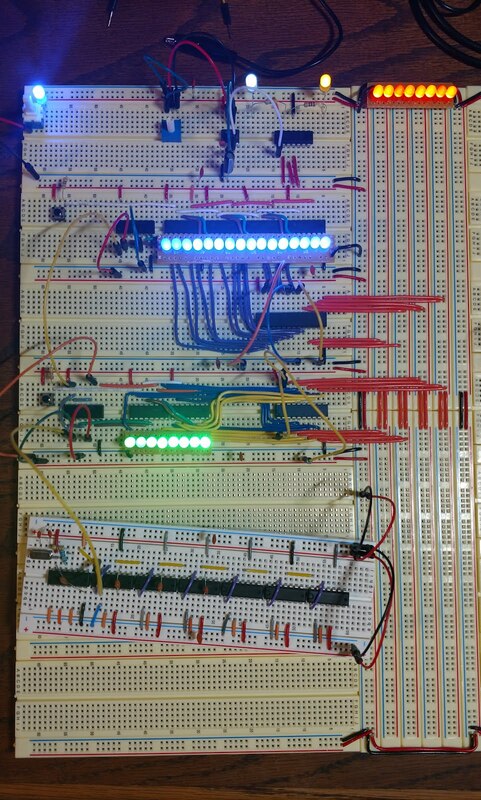 The milestone I'm shooting for next is to have a program in ROM control the Data Pointer and Data Register counters. But first I need to work the new clock design into the computer. 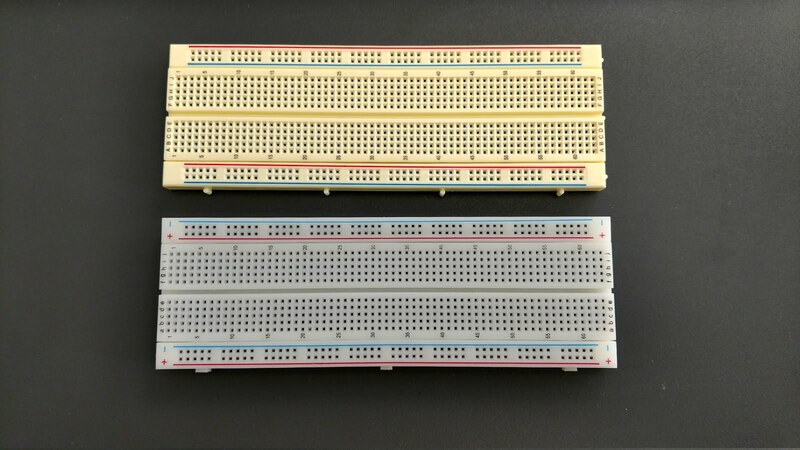 As much as I have ranted over the first breadboards I used for my Brainfuck computer, the company behind them has tried to help. After I left a one-star review on Amazon, they admitted that their manufacturing quality varied and sent me new ones. They were indeed a bit better than the first ones in a few specific ways, so I bumped my review up to three stars. Over time, the experience was more unpleasant than first impressions suggested. 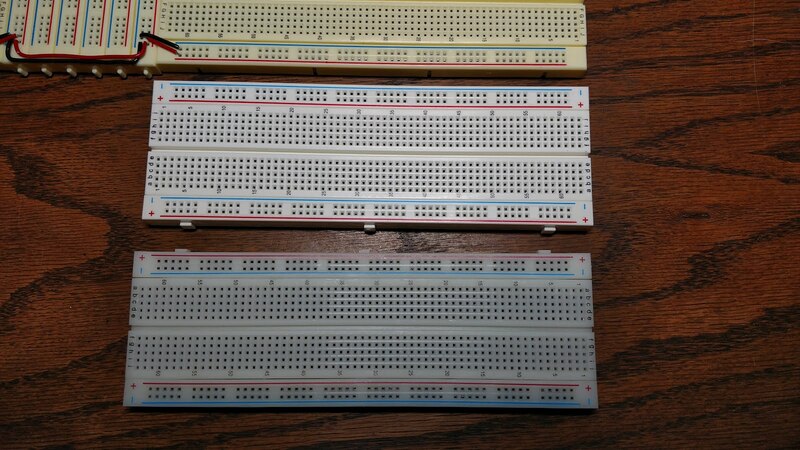 They couldn't compete with a few other cheap breadboards I've acquired over the years. I won't list my grievances again here, but I decided to go back to a one-star review. Once again I apologize for all the inconvenience caused in this case and I look forward to your reply. Thank you very much!! After bouncing back and forth between USPS facilities in San Francisco and Oakland for a week, they arrived a couple days ago. Whether the cynic in me turns out to be right or not, these new ones are vastly improved over the originals. Two things are obvious at first glance: the plastic is much higher quality, both in look and feel, and the silk-screening is clearer. On closer inspection, there seems to be much more consistency in the way the contacts line up with the holes. Here is a close up of the old board. You can see several areas where the contacts are directly under the holes. This would block entry of pins unless you put them in at an angle, which might go off to the side of the clip rather than into the center. One thing you might notice is that the contacts are much more visible in the new board when looking at an angle. 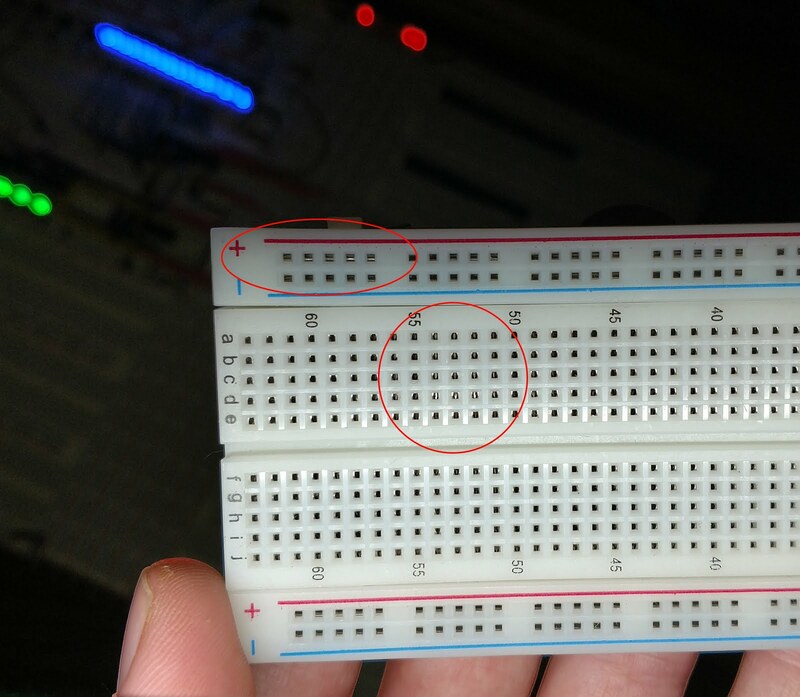 You can see the bright spots on the left side of the holes on the left part of the board but on the right side of the holes on the right side of the board. 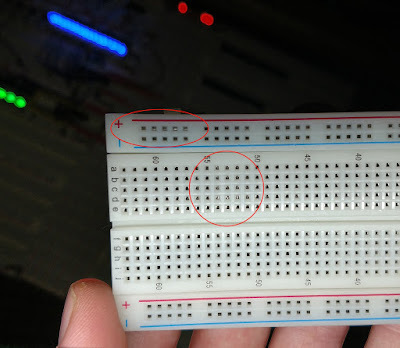 This shows both that the contacts are more centered with respect to the holes and that they are closer to the surface of the breadboard. Combined, these two fixes should alleviate most of the problems I had with the old ones. Insertion of components with multiple pins is much less frustrating, and retention of components is much better. In particular, these new boards seem to hold onto my DIP and tactile switches just as well as the Jameco boards. The new boards also lay much flatter. The old ones had a noticeable curve out of the box, so they would tend to stretch and strain when assembled into a large panel. Here's a video demonstrating the improvements in curvature. Note: I'm using the one old Elegoo board that remained completely intact (I didn't cut the power strip off) to give it the best chances. 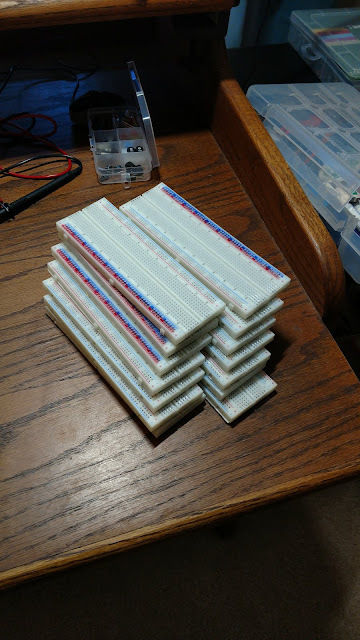 I have not yet done any serious testing of their electrical characteristics since I'm not planning to assemble these into another computer. The contacts don't feel quite as eager to grip as the Jameco ones, so your mileage may vary. All in all, I'm actually quite glad to have these three new boards. I had been using some of the old ones for a couple side projects, and am eager to transfer them over. All in all I'm happy with their performance. While the power connections feel a bit looser than the Jameco boards, the electrical contact seems pretty stable. The board has no problem handling an 8 MHz crystal clock with a 24 stage (6x4 bit counter) TTL frequency divider. There is virtually no noticeable effect on the clock outputs when I jiggle the power leads coming into or jumping across the board. I'm not sure how they'd behave in the bus strip/massive board configuration I'm using for the computer, but so far they look promising.